Caroline is a Senior Paralegal with the firm`s Patent Prosecution team. Caroline has extensive knowledge of Canadian and foreign patent practice, including PCT procedure, covering all aspects of patent filing, administration and client service. She regularly corresponds with Canadian and foreign clients, as well as foreign associates, on many aspects of patent formalities and prosecution. 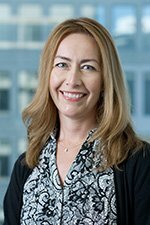 Caroline is also involved with the filing and prosecution of industrial designs and coordinates the general prosecution of large international patent portfolios.